Encounter: Southern stingrays. There are actually two feeding spots in the North Sound on Grand Cayman. One is Stingray City which is about 15 feet deep and attracts dive boats. The other is Stingray Sandbar which is only a few feet deep and on a busy day attracts hundreds of cruise ship tourists. Although the Stingray City feed has fewer people, the shallow water at the sandbar is better for photographers. Divers enter the water with squid wrapped in plastic bags. 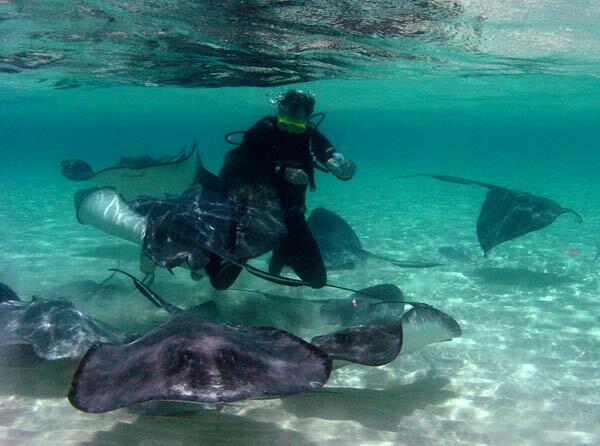 The rays come in instantly and push divers around aggressively searching for the food. Although they do not have cutting teeth, their insistent sucking and mouthing can leave nasty "hickies" on a diver's skin. Once they have consumed the fish or squid they soon lose interest and swim away to rest in the sand at a safe distance. I'm not aware of anyone ever getting stung during these feeds. Operators: There are a number of operators around the island that run trips to the sandbar. On any day that cruise ships come in there will be trips to the sandbar and on most days one or another of the dive shops will be heading to stingray city. If you rent a boat it is also possible to go to these sites unguided. The advantage of this is that you may have the entire site to yourself. If you try this its worth stopping for a snorkel in the mangroves along the way. Accommodation: Most people will dive Cayman on a package tour. If arriving independently there are hundreds of hotels to choose from. Directions: To get to Stingray City and the Sandbar independently, it is best to launch from the Yacht Club which can be reached from Seven Mile Beach. Once out in the north sound you can usually see a cluster of boats to the north just inside the reef break. These boats will be at Stingray Sandbar. The North Sound is usually calm and easy to motor across. 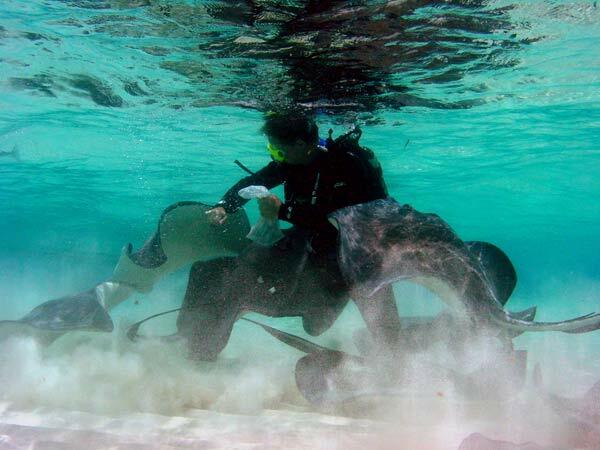 If you would rather dive Stingray city you need to find the correct market buoy for the site. This is located towards the other end of the mouth of the sound (further west). It is fairly close to a set of channel markers so if you moor to any of the buoys in the area and go for a quick snorkel, the stingrays will let you know if you're in the right place. You can buy frozen squid at the gas station shop in the Yacht Club Marina.